This Provence holiday rental home is located between Nice and Cannes, 13 kilometers from the airport of Nice. The villa rests in the 'Domaine' Vaugrenier Présidences, a guarded and secure area beyond and above the Parc National de Vaugrenier and the highway A8. From the house you enjoy a magnificent, panoramic view over the Park and the Mediterranean Sea. The Domaine also comprises two tennis courts, a playing-ground for children and a nice swimming pool, all for the exclusive use of the inhabitants of the Domaine. About 50% of the inhabitants have their permanent homes here. The distance to the closest beach is 1,5 km. Nearby you find a Marineland, Amusement Parks, Casinos and numerous other attractions. Within 10-30 minutes by car you reach 20 golf courses. The charming town of Biot is 5 minutes away. The house is 120m2 with two floors. There is a south-facing terrace, in addition to a garage where two cars fits. - A large livingroom with an open fireplace and direct access to the terrace. There is an build-in aircondition. - Diningarea with open access to the kitchen and the livingroom. - Three bedrooms where one of them have a doublebed, while the two others have two seperate beds moved togheter. They all have airconditiong. - Two bathrooms where one have a shower and a hottub and the other have only shower. Both contain a toilet. I am a lawyer, my office is in Oslo, Norway. My wife Margaretha is half French and speaks the language fluently. She keeps the contact with our housekeeper, the gardien of the Domaine and the various companies that help us maintain the high standard of the house. We have rented out the house part of the year since it was finished in March 2002. This activity has offered us so much pleasure in the contact with our leesses from around the world. We always try to give them a personal contact and offer them a stay that suits their needs. The house is bright and lovely. The big terrace offers a great place to barbeque and enjoy the garden and enjoy the view of the ocean and the Provençal green surroundings. Miele dishwasher. Very silent in use. 2 refrigerators. One in the garage. Several games and different toys for kids. Specially for the outside. Beautiful terrace with panoramic view over the Mediterranean sea and towards Antibes. 2 tennis courts free of charge. There are many golf courses in the area. The Domaine has a nice pool area, a 5 minutes walk from the house. There are showers and toilet facilities. There is a ping pong table in the area. 1st floor contains: - Large living-room with fire-place and direct access to the terrace, satellite television with all main English channels, air-conditioning. - Provence style kitchen with all facilities, air-conditioned. - Dining-room, separated from the kitchen with a counter, open to the living-room, air-condition. - Small office (with high quality sleeping couch)- not air-conditioned, but with fans. - Laundry room with washing-machine, tumble drier and bench for ironing etc. - Guest toilet. 2nd floor contains: - One bedroom with a double bed, two bedrooms, each with two single beds together - air-conditioning. - Two bathrooms, one with a bathtub and shower, one with shower only, both with a toilet. The bathroom floors are heated. We had a wonderful time at Villa Soleil. The owners had thought of everything. They were helpful and informative. The villa was immaculate and well equipped. Couldnt praise it more. Thank you. Thanks for your great review. This is our goal: That our lessees feel at home in a well kept house. We would be more than happy to welcome you back. It was a delight to return once more to Villa Soleil. The Villa is aptly named as the Sun House, as we enjoyed the sun from early morning to glorious sunset at night. We especially like the way that the villa is nestled into the hillside. It provides complete privacy on the patio, while we still get to enjoy an unencumbered view of the Mediterranean and village of Antibes. Even in Fall, we spent a lot of time sunning and dining al fresco on that patio. The house itself is very comfortable, clean, and well-equipped. On this last visit, the fall evenings were spent lounging in front of the log fire. It felt very much like home. The location of the Villa is especially good. It is close to the action, yet slightly removed for relaxed downtime. It is within easy reach by car to the technology park of Sophia Antipolis for those that need to work there, and the picturesque villages of Antibes, Biot, and Valbonne are only minutes away for markets and pleasure. It is also nice to have Monte Carlo, Cannes, Nice, and Eze within easy reach by expressway, and to have the alternative of a scenic coast road for a lazy afternoon return. Villa Soleil holds nothing but good memories for us. I expect you will see us again. Thank you, Paul, for your very nice review. We agree to your descriptions, and hope that you return soon to visit. Villa Soleil, Beautiful home from home. 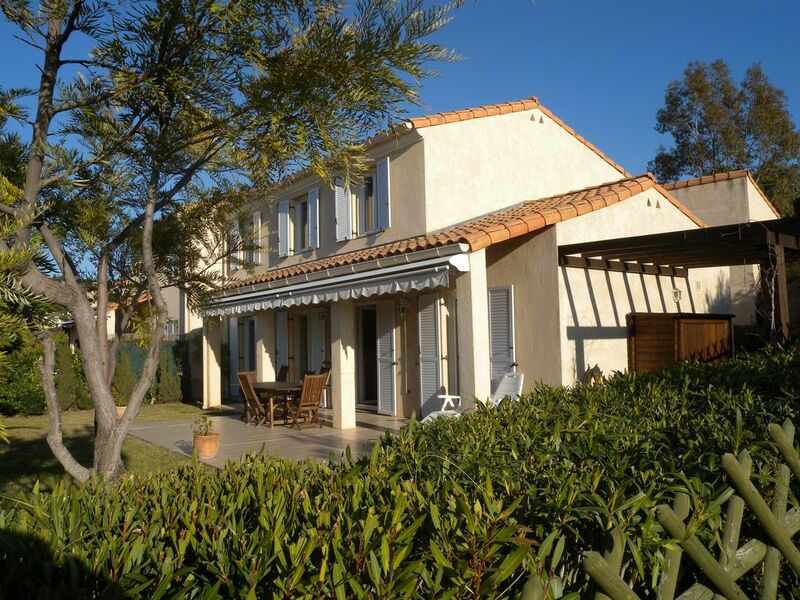 Villa Soleil provided a superb quality cote d'Azur location with ample accommodation for our family group of 3 Adults and 3 very active Children. The Villa is beautifully furnished and very well equipped with high quality furnishings. Everything Works Perfectly! Domain Vaugrenier Presidences, proved to be both exclusive secure and friendly! Beautifully located with only minor noise disturbance from the autoroute at times. Tennis and Swimming facilities were 1st Class as expected. Villeneuve-Loubet-Plage has an attractive clean Mediterranean style pebble beach. We had a great time and wish Margaretha and Tom every happiness with their beautiful Villa Soleil. Will we be back???? We can only DREAM.....…. We wish you welcome back. Vacational home at Cote d'Azur. Holiday rental between Nice, Biot and Antibes. Panoramic ocean view. Other Activities: Amusement park, water land, mini golf, golf, tennis, go-cart, adventure park. Golf: The closest golf courses are outside Biot and Valbonne, 10 to 20 minutes drive from the house. The lease includes bed linen, towels, electricity, fire-wood for the fire place and wire-less internet. There is a fee for cleaning on departure, to be paid directly to the house-keeper. The deposit falls due on booking. Will be refunded after the lease. The lease falls due in full for payment 60 days prior to the lease (no deduction for the deposit).